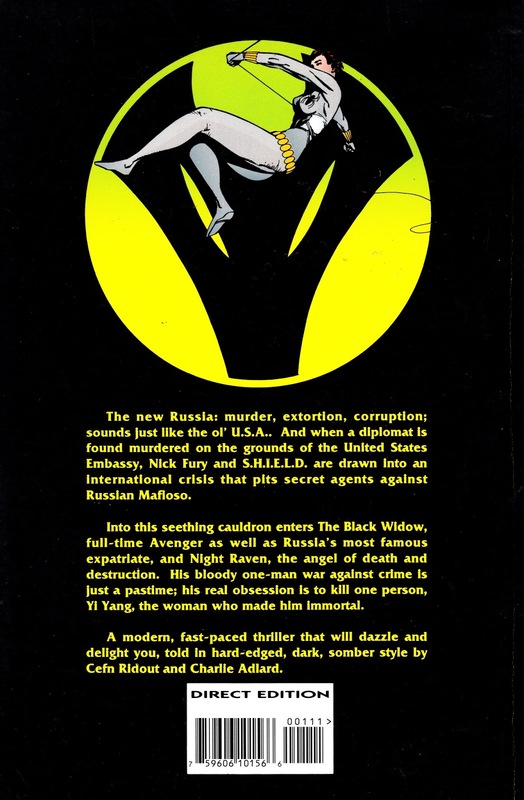 From 1995: A possibly oft-overlooked addition to the MARVEL UK pantheon, with excellent creative credentials, that snuck out of the New York office after the British branch imploded. 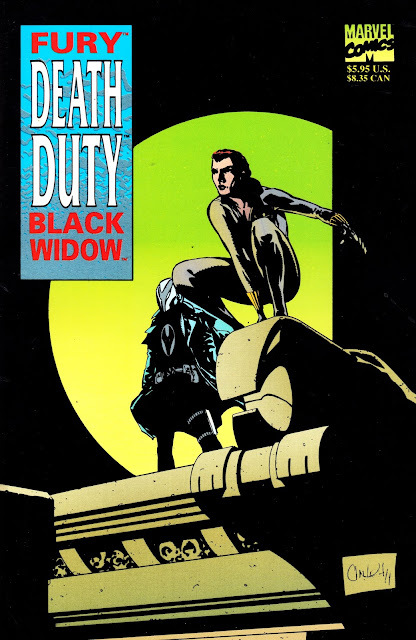 DEATH DUTY was a done-in-one bookshelf format edition starring Nick Fury, the Black widow and M-UK's Night Raven (apparently making his US debut despite having been appearing in assorted British books from 1979 onwards). Despite the title, there's no sign of former M-UK favorite (and notoriously frequent other-comic-gatecrasher) DEATH'S HEAD II. Writer Cefn Ridout was the former Editor of DOCTOR WHO MAGAZINE (during the troublesome 'hiatus' period circa issue 100 of the mag) who later worked for the short-lived Manga Comics in the UK, overseeing the likes of THE X-FILES, MANGA MANIA and SPACE PRECINCT. Charlie Adlard illustrated THE X-FILES for Topps... and a whole lot more. Adlard currently illustrates THE WALKING DEAD comic. Cefn Ridout also worked on STARBURST before marvel sold the rights to visual imagination.